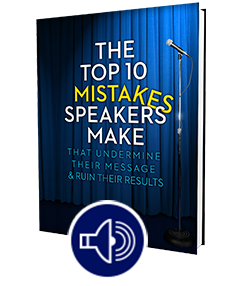 The Top 10 Mistakes Speakers Make That Undermine Their Message and Ruin Their Results! I have to come clean. In this month’s Business Insights newsletter we sent out a couple of weeks ago, I highlight three changes I’d made in my life that’d made a big difference in feeling less overwhelmed, more on top of things, and generally freer. I’d decided to simply my life by taking on less. I created some new boundaries to protect me from the overachiever, Type A, driven me. And I gave myself more self-care time. I was pretty proud of myself for making them. And everything was going great. While I’m still doing fine on the cutting back, I’m not doing so well anymore on the added self-care and the boundaries, which included things such as not working past 9 pm. I haven’t been to my yoga, Pilates, or stretch classes more than a couple times recently. I’ve been working late too many nights again, and I haven’t been getting that hour for myself in the morning before things get going. In short, I’m a backslider. But here’s the thing. That doesn’t differentiate me from the rest of the population. We all have a proclivity to backslide. We all resolve to do things we know are good for us and then we start making exceptions … just for today … because we’re too busy, there’s not enough time, we’re tired, or whatever. Well, there’s only one thing to do. That phrase has always stuck with me. It’s such a simple, non-judgmental acknowledgment that none of is perfect and it takes a while to cement new habits into your daily routine. So, you just have to start over and keep going until you manage to integrate all this new stuff into your behavior patterns … until doing it becomes second nature for you. Bottom line: The only way you lose at this game is if you stop playing … if you stop starting over. I’m starting over on two of my three things. Where do you need to start over? Are You Acting Like a Spoiled Child? Meet Denise: Denise Hedges is a Business Development Coach and Speaker Coach for small business owners who want to be more comfortable, confident, and successful with their sales and marketing efforts. She specializes in helping them use speaking as a way to dramatically improve their results! Discover the Mistakes Speakers Make That Undermine Their Message and Ruin Their Results!